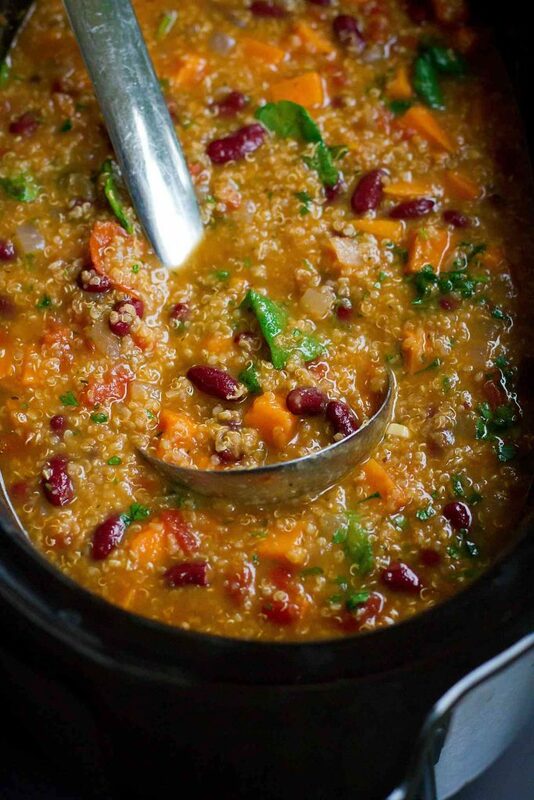 This Slow Cooker Bean Soup with Quinoa and Sweet Potaotes is packed with fiber and flavor. Throw everything in the crockpot and walk away! Thank you to USA Pulses and Pulse Canada for helping me share this recipe with you. It seems highly unlikely that my proposed rule #2 will be enacted, so I’m turning to every 30-minute meal and slow cooker recipe in my arsenal. I will hazard a guess and say that the crockpot was first invented by someone who had just cooked several holiday meals and was tasked with whipping up a healthy family dinner. I will be forever grateful. This slow cooker bean soup requires about 5 minutes of sautéing before throwing all of the ingredients into the crockpot, pressing start and walking away. Yes, there’s a bit of chopping, but that should take less than 10 minutes. If you’ve followed along this year, you already know that I’ve been talking about the United Nations’ International Year of Pulses and encouraging you to sign The Pulse Pledge. Pulses include dry peas, beans, lentils and chickpeas and I’ve been making a concerted effort to add them into our diets at least once a week. 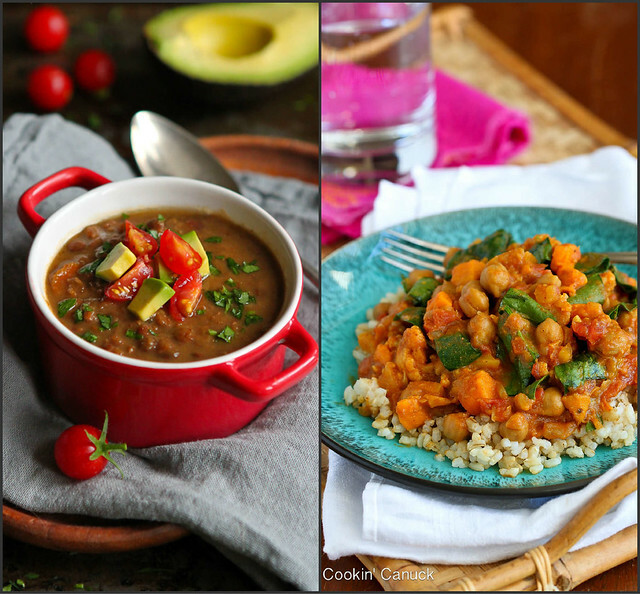 Truth be told, that hasn’t been too difficult – pulses lend themselves to stews, soups, salads, breads and many other types of recipes. While dried beans are always a great option, I chose to use canned red kidney beans for this slow cooker bean soup. They’re economical, easy to store and require just a quick rinse before being incorporated into a recipe. 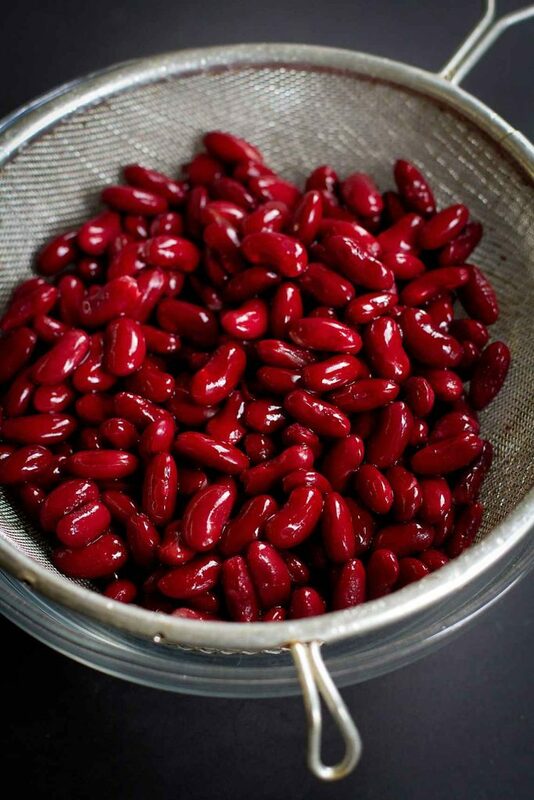 Red kidney beans do a great job of absorbing the seasonings in the dish, making them a go-to ingredient for soups and chili. And let’s not forget that red kidney beans are an excellent source of protein, fiber and folate, along with other nutrients. If you prefer a broth-ier soup, stir in some additional vegetable broth shortly before heating. The quinoa absorbs a lot of liquid, so will turn your soup into a stew the longer it sits. Either way, it’s perfect for dunking in a chunk of crusty bread! Heat the olive oil in a large nonstick skillet. Add the onions and cook, stirring occasionally, until softened, about 5 minutes. Stir in the garlic and cook for 1 minute. Transfer the onion mixture to a 6-quart slow cooker. Add the kidney beans, sweet potato, quinoa, diced tomatoes, Italian seasoning, salt and pepper. 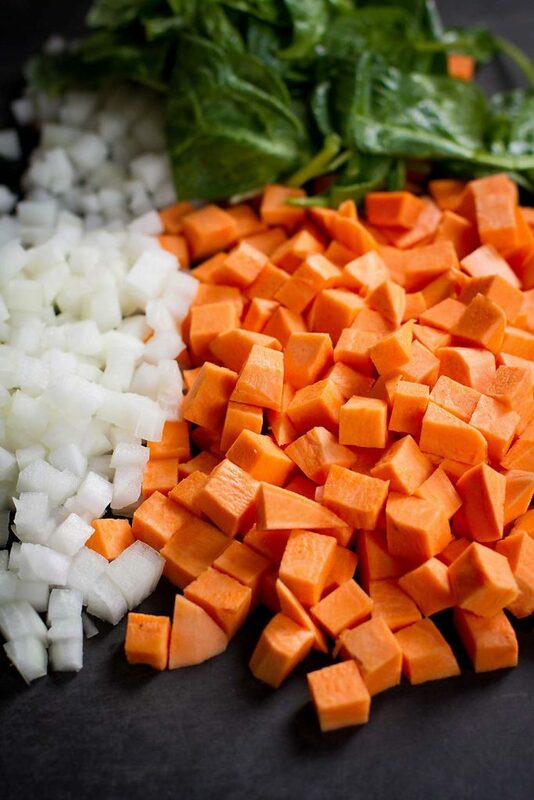 Cook on LOW for 6 to 8 hours or on HIGH for 3 to 4 hours, or until the sweet potato is tender. Stir in the spinach, parsley and hot sauce. Adjust seasonings to desired taste. Serve. Disclosure: This post is sponsored by USA Pulses and Pulse Canada. All opinions are my own. This post contains links to my Amazon affiliate page. Any revenue made from sales through these links helps to support this blog. Thank you! Is the quinoa raw when you add it? Hi Debbie – yes, the quinoa is dry when added. I hope you enjoy the soup! Ohh this looks so flavorful and comforting! You speak my love language!! This looks so good! This looks so filling! I need to make it this week since it’s perfect for chilly days! I would love a bowl of this soup on a cool fall day! You are absolutely reading my mind Dara. I have had absolutely no desire to make dinner this week or this past weekend. It’s catching up to me and this soup is what I need!! I love how lentils and quinoa thickens up a soup and make it so hearty in the best way possible. wow love all the flavors in one dish! I am obsessed with this soup. Healthy and beautiful all at once. 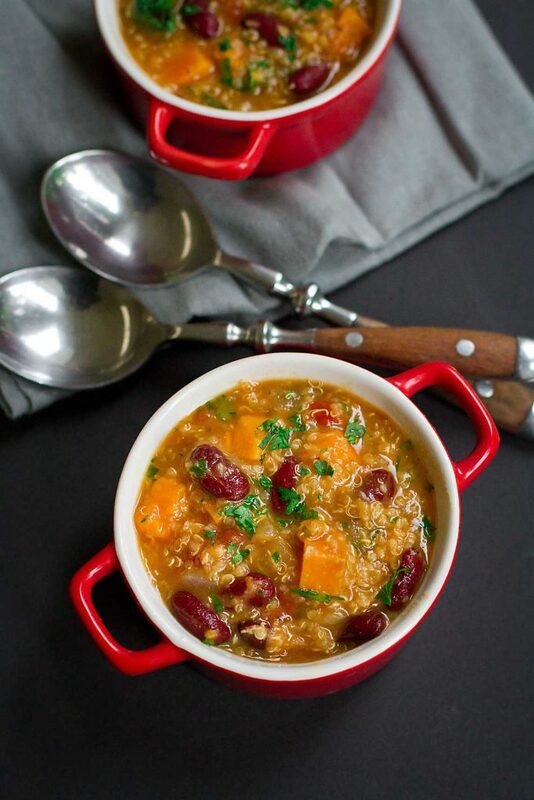 This is a great soup to help us get through the cold winter days ahead! Delicious! This looks so great for these chilly weeknights where I run kids around for hours and want something healthy and warm for dinner! Love a super easy recipe like this that has so much wonderful flavor! This bean soup looks so delicious! 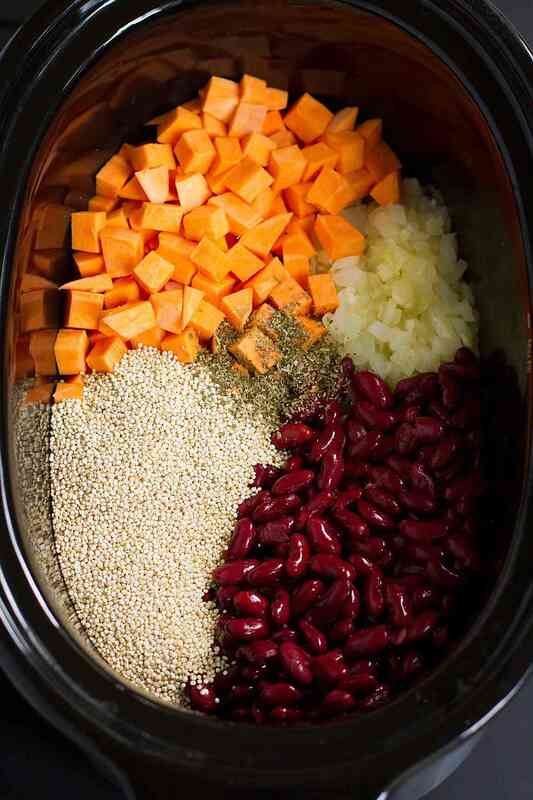 Love the pop of color from the red beans and the sweet potato. Mmm, the perfect fall dinner! Delish! I used garbanzo beans and butternut squash because I had that on hand and kidney beans are not my favorite. I also sprinkled Feta cheese on top. I will absolutely make this again! Oooh! I love heart, slow cooker recipes like this one! Yummy! I love all your recipes! Was going to make this today but noticed the amount of vegetable broth is not listed. Please help! Thank you so much. Edited to add the broth amount. Two words: Make this! This is just so damn good! I added some extra broth at the end, as mentioned in the recipe, because we wanted more broth. I couldn’t believe how full I was after just one helping. Do you think this could be saved in freezer to be taken out when needed to throw in crock pot? I want to make this but the adjustment button don’t work . When I put 4 servings it gives me 4 cups of quinoa. Hi Luz, it should be working now! Nice soup recipe, Is it suitable for 1 year toddler ? I wants to prepare this for my daughter. Hi Cynthia, I suppose it depends on what foods you’ve introduced to your daughter at this point. If she typically eats the items in the soup, then I’d imagine she’d like it, though you might want to omit the hot sauce from her portion.